These (below) stakeholders have teamed up to address the late night issues in the downtown core and in residential neighbourhoods which have a high concentration of student housing. Safe Semester runs until September 30th, 2018. 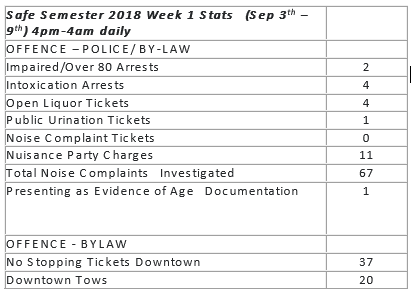 Guelph Police Officers, in conjunction with By-law officers and University of Guelph Off Campus representatives, throughout the duration of Safe Semester will continue to attend to residences proactively to educate the residents as to their responsibilities and the risk they encounter if they host a party.